Bedrock Ores is a world-gen mod that adds a unique method of resource acquisition. Instead of regular ore blocks it spawn ore clusters embedded in the bedrock. These can then be harvested by the player, behaving much like the contained ore does, except that the block will never fully break. Each time the contained ore would break, its drops are spawned and the bedrock ore's yield is reduced. Once the ore deposit is exhausted, the block will simply turn into regular bedrock. The yield of the bedrock ore veins goes up the further away they are from spawn, so digging them up by hand will get tedious quickly. To make your life a little easier, the mod also adds a single machine block, the Bedrock Miner. This machine will automatically harvest bedrock ores in the 5x3x5 area below it. It needs to be powered either by pumping burnable materials, such as coal, into one of its sides or by connecting it to an external power source; Forge Energy and classic Redstone Flux are supported. All harvested ores will be ejected into an inventory above the miner. Note that the machine will stop working if there is no inventory to eject harvested ores into. 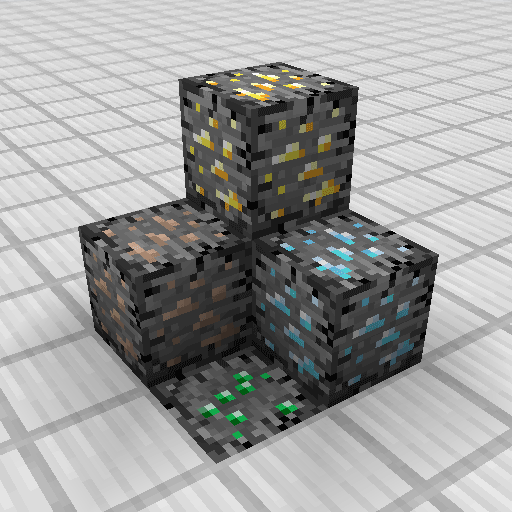 Note that the mod adds no ores of itself, it just wraps existing ores. Any ore that does not use a tile entity should be supported (which I'd wager is roughly 99% of all modded ores). Bedrock ores simply wrap the block state of the actual ore and forward relevant calls, such as checks for harvestability. Think Carpenter's Blocks. The mod supports retrogen, i.e. it will generate bedrock ores in already generated chunks, unless configured not to. This means you can throw it into your pack and keep playing your old worlds, and bedrock ores will pop up where they would have been, had the mod been present right from the start. While the config contains a few nice high-level settings, if you're working on a mod-pack you may wish to dig deeper, and adjust ore spawns on a per-ore level. That's what the JSON config system is here for. Once you've run Minecraft with the mod installed at least once, you'll find a JSON file in your .minecraft/config/bedrockores directory alled _example.json. This file contains an example entry for an ore definition, i.e. settings for an ore that may spawn as a bedrock ore. You can also have a look at this file in the repository. You can either add custom entries in that file directly, or create your own JSON files following the same format, i.e. one array of objects with ore definitions. To adjust single properties of an entry, you do not have to copy the full entry from the defaults, you just need to use the same block state definition and specify the properties you wish to override. All other properties will use the defaults/previously defined values. Note that this means the order in which files are loaded may be important, if you adjust the same ore in multiple files; JSON files are loaded in natural order, i.e. file4.json is loaded before file10.json. The same principle holds for all other properties as well; use the same state and override any individual properties you like. It should be trivial to add ores from other mods (see the Configuration section). If there's any you'd like to see in the default config, let me know. Note that the bedrock vein config allows grouping blocks. From each group, only the entry with the lowest sort order will actually be used. So e.g. if you have both TF and IC2 installed, it will automatically only generate TF copper in bedrock veins by default, and no IC2 copper. This makes the default config usable in most cases with just a few tweaks. You can easily change the order of these in the config, or if you need more precision, via the oregen JSON files. I've never been quite happy with how automated resource acquisition works in modded Minecraft. It's either magical blocks that harvest massive areas (BuildCraft Quarry, Mekanism Miner), or blocks that generate ores out of thin air (MineFactory Reloaded Laser Drill, all those boring magical plants). At least some of them with a limit per location (Immersive Engineering Excavator). The IE way is pretty close to what I wanted, but that the generated ores did not have any in-world representation still bugged me. So, playing a bit of Factorio, enter the idea of multiple ore drops per block. Now let me stop you there: yes, Dense Ores are a thing, but they still drop all at once, so not the same at all. The only problem with this idea was having a quasi-unbreakable block somewhere, possibly in the way: depending on yield, it can take quite some time to get rid of it. But rejoice, there's some unbreakable block in Minecraft already, quite a lot of it, actually, and it is called bedrock. So that's when it clicked for me, and here we are. If you'd also like to give a fresh kind of ore generation and automated mining a shot, this mod might just be what you're looking for. Btw I think there's one more thing that could improve this mod. Being constantly at bedrock level in order to mine resources is a bit tedious, especially in early game. Having my base at Y=1 in order to mine a LOT of stuff I can't enjoy the exploration of the surface anymore, or the never ending biomes o plenty experience. Therefore it would be awesome if there's an option either to move the B-ores on the surface or to generate them at highier Y levels. I hope my suggestion makes sense. Still, this is an awesome mod. Since theres a command that wraps a ore in bedrock and makes it a bedrock ore would it be possible to add a command that adds the ore to the config for you so its easier for modpack makers to add ores that aren't in the config by default. it would make things easier for you too since you wouldnt need to add ore support in the config ether when you update the mod. I really like this idea, going to check it out. Kudos! Could you add NuclearCraft to the supported mods by default? Do the configs allow you to change the area that the bedrock miner mines in? I'd like to change it so that it only affects the block directly below it. Hey, I love this mod, I've been here before. I would like to request a feature, (or maybe a compact to go along with this mod) allow us to define what blocks these spawn in (stone or sand or gravel) and to define what blocks they become when they reach 0. I would like to use bedrock ores as the default ore, on a biosphere pack. However I want them to spawn in stone, and turn into stone when drained. Or perhaps the surface of sand (oil sand) and become sand when fully drained. if i'm using COFH world's flat bedrock feature, will these still spawn? Yes, Just set the weight of this mod higher then TF's world gen, also set the y level to 0 for flat bedrock. Would it be possible to make the bedrock ore blocks have infinite output but with a long cooldown after mining the block? I'd like to be able to build permanent mining outposts that you could return to every couple of Minecraft days. Preferably they would "regenerate" without the chunks being loaded. Brilliant mod, although I have one question: Is is possible to disable mining the ores by hand, so that miner (either explicitly the one your mod provides or any other mod, possibly a block breaker and similar gadgets) is needed for ore extraction? Mining thousands of ores with stone pick seems OP to me, some effort and automatization requirement would make the mod flawless for me. 1. is there a way to change the size of the ore patches, like in Factorio? 2. any recommended way to find Ores, other than just blind mining? He has another mod called scanner, or set a Builder to quarry everything y 1-3 (if you have flat bedrock) and walk around. Can't seem to power the miner anymore. Might be happening after thermal expansion update. Thanks for awesome mod , i support pretty much all you wrote in "Why?" section. What should i type to specify metadata value ? For example thermalfoundation:ore_fluid with metadata 2 means redstone clathrate type of ore(according to TE config). What exactly i write to .json to specify that ? So far i digged into TE mod .jar to see what "type" their clathrate ore have (surprise! It was simply redstone) , but that seems unyieldy. If you could tell how to specify metadata of ore , perhaps ? PS great mod , it was long due. I also wanted to get away from vanilla hunter-gatherer type of resources collection and do _resource managment processing and manufacturing systems design type of gameplay_ (aka Factorio style).